In this Article we will go over how to use the Reporting Tab to pull a report and sort the data to run the report you want. Click on a Report category. In each Report category a drop down menu will display the specific report types available for you to run under that category. Once a report is selected a preview of that specific report will be displayed at the bottom left below the report menu as a quick means to verify this is the report you wish to run. You also have the option to "Click to View Sample" if you like. 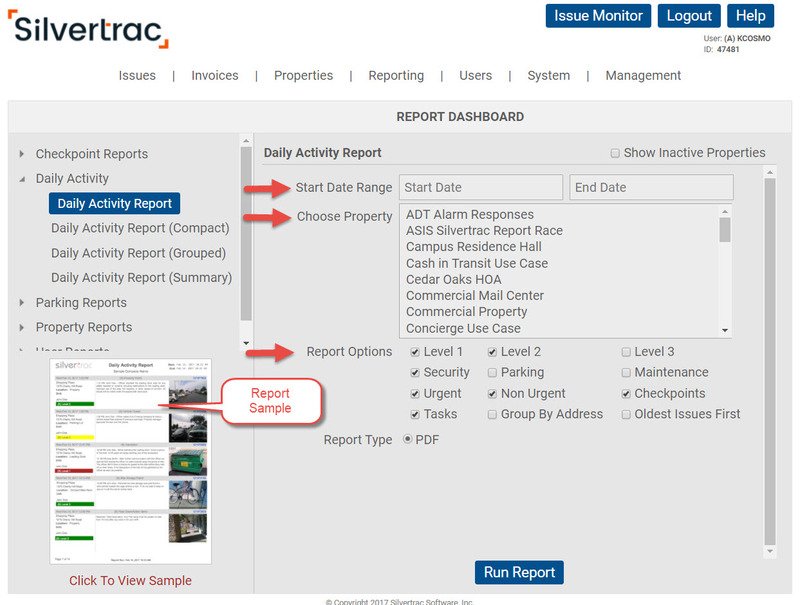 The report parameters typically are outlined with date ranges, report option boxes and drop down menus depending on the type report being run. Date range limitations on selected reports, that exceed specified parameters on a specific report, type or format, will pop up in red and note the limitations. Once the report parameters have been correctly entered, select the blue Run Report box at the bottom of the page and your report will automatically download as a PDF or CSV file. NOTE: There are currently over 25 different ways to view the data collected into a specific report in Silvertrac , and they can all be accessed from the "Reporting" Tab.